Keno is a simple, yet fun, game to play to win real money and has been available in NSW registered clubs since September 1991. Games are drawn every three minutes and the results are televised on the screens located in the participating NSW venues. However, if you can’t get to a venue or you simply prefer better odds we recommend going online, as we have detailed further below. New South Wales keno is run by Tabcorp Holdings, a gaming, wagering, and keno operator, as well as Clubs NSW. Offering keno to more than one million customers across NSW, you will find the game in more than 1800 venues, including pub, clubs, hotels and anywhere with TAB facilities. Tabcorp originally had a license for NSW Keno until 2016. They have extended their license until 2050, which cost the wagering giant $25 million. You can find keno in both paper ticket form – hopefully the pencils are still available to fill your form out – with new games available every three minutes, or electronically via gaming machines at your local pub, RSL, or club. But if you aren’t one for the pub scene, or you always find there aren’t any pencils left, you can indeed go online for real money. Playing keno at land-based venues in NSW is simple. When it comes to playing via the paper form, players simply pick one to 20 numbers (you can also get 15 number or even 40 number games) out of the 80 numbers available on the form, by marking a cross through each number. These are the numbers you want to be drawn. You then take your form to the attendant of your keno venue and they will put through your selections. You can then watch the screen/s at the keno venue to view your game/s or you can also download the keno app to your smartphone or tablet to view the results if you can’t get close enough to a screen. While venues use to draw the numbers manually, the majority of keno games you will find in NSW is completely automated – meaning it runs on Random Number Generator (RNG) software (the same type of software used for keno variants online). You may still find keno drawn by croupiers at casinos in NSW – specifically Star City Casino – but if you go online you can actually find a live dealer keno variant, which we will detail below, where a real human draws the numbers. In each game 20 numbers are randomly drawn and the numbers you have chosen are called spots. When your numbers are called this means your spots are caught and you will be paid accordingly. If you match the numbers, you have the chance to win up to $1,000,000 and all you have to spend is $1. But remember – your odds are quite high with a house edge of 15-30% at most land-based venues – yet another reason to go online. If you win, you will be paid according to the amount of numbers you chose correctly. There is also the option of playing Heads or Tails, which you will find on the back of the keno form. 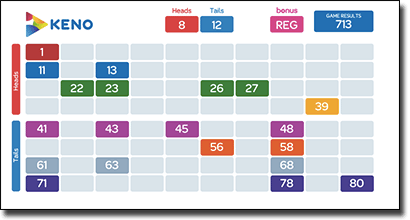 Players pick whether or not there will be more numbers drawn in either the Heads or Tails section as detailed on the form. Then you simply pick how many games you wish to opt in for and how much per game. You will then be paid 2:1 for every correct game. While you will find keno nearly everywhere you go for a drink, you can actually find it online from the comfort of your own home. Since the majority of keno in NSW uses RNG software, there’s no difference when going online. In fact, there are more benefits including you get to decide the pace of the game, you’re playing a game which have a better house edge (from 8-10%, which is still high but better than land-based venues), and there are a number of variants available for both desktop and mobile devices so you can play on the go. We detail the best places the find keno variants which are verified as secure and offer clear payout tables to determine how much you can win. G’day Casino – G’day offers five keno variants, with one offering traditional gameplay and the rest featuring unique gameplay. Additionally, you will find a live dealer keno title here, which is powered by Ezugi, where a dealer draws out the numbers from a barrel after you’ve placed your bets via the digital keno layout. Emu Casino – There are seven keno variants available from a variety of software developers, including Microgaming, 1×2 Gaming, and more. Guts Casino – There are two keno titles available at Guts including a progressive version where you can win a medium sized jackpot, as well as a traditional variant. All Slots Casino – There’s just one title available at All Slots casino, but the Microgaming keno game offers traditional keno gameplay. Sign up to any of these sites by clicking our links and take advantage of their great new player welcome bonuses too – another benefit of playing keno online.